Taiso Yoshitoshi (1839 - 1892) Tokichiro’s First Battle at Fujikawa From the series A Record of the Advancement of Toyotomi Hideyoshi, 1869. Oban Triptych. A notably early triptych by Yoshitoshi and still very much in the Utagawa style of his teacher Kuniyoshi. Some things stand out immediately: the rearing horse is borrowed from Kuniyoshi who in turn borrowed it from Renaissance painters (probably Paolo Uccello) via books of Dutch engravings; the figures on the far bank are drawn in the Utagawa style; but also the contrasting figure of Tokichiro (Hideyoshi) in the left panel who is drawn in Yoshitoshi’s emerging style. The border - known as a Paulownia border after the leaves - is intact, which is rare, as this has more commonly been trimmed off at some time. 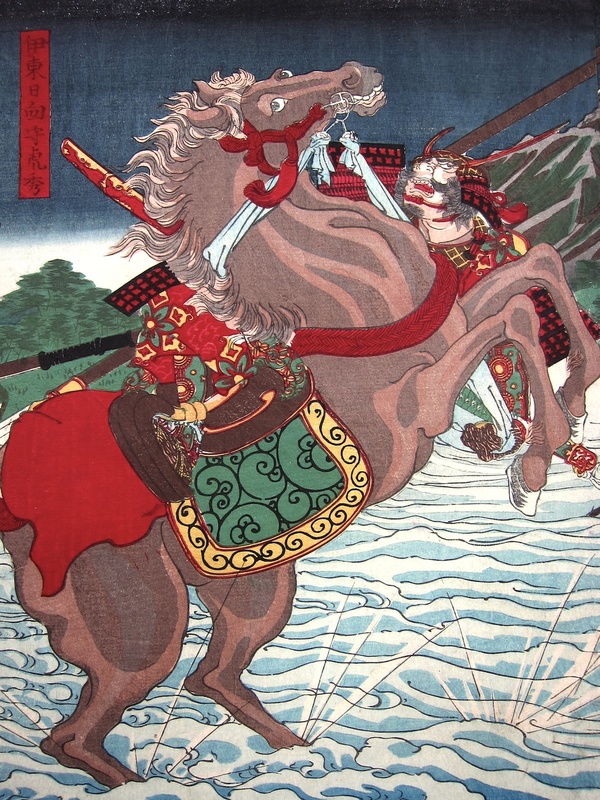 The series commemorates the rise to power of Toyotomi Hideyoshi (1537 - 1598), one of the great unifiers of Japan. This print depicts his first battle. Arriving at Fujikawa he hides in the bushes and ambushes the commander of the enemy forces, Ito Hyuga no Kami with a spear. It is the opposition forces on the other bank who are gesturing in anger. This is an excellent and rare early Yoshitoshi in perfect condition. Full size with borders, colour, impression are fine.